The research center of Information Technology University has conducted a research regarding Fraud SMS Detection in Pakistan. As we know that, with the advent of technology, the numbers of scammers have also been increased rapidly. They are making innocent people fool by their unethical ways to earn money. For illiterate people, this condition is alarming as they become an easy victim. So the finest department of ITU is going to solve this issue and they have proposed a solution. Most of us are receiving many fake SMS which forces to take any action. Hence, they make you fool through their fraudulent activities. If you receive such messages, then you should go through this process. 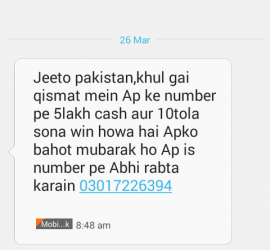 SMS from ARY Jeeto Pakistan. The researcher proposed an algorithm through which the scammers can be detected. Moreover, this algorithm will block such SMS and you will never receive any SMS. Furthermore, the person who is sending the SMS will be able to send the SMS but the person who is receiving this cannot able to receive it. And this will be stopped in the middle during the transfer process. This algorithm is in Data collection process and they are collecting the fake SMS so that they can actually work on it. Every citizen of Pakistan is advised to participate in this great initiative. Although this Fake SMS Detection in Pakistan project is still under development and the research has been proposed. Here is how you can participate in this research and make sure about its success. First of all, you can send the fake SMS on the following WhatsApp number; 03144362352. Moreover, you can also forward the received fake SMS by writing Forwarded from. Furthermore, you can also send the screenshot of the SMS as a prove. The screenshot should contain the message content and the number of the sender. When you have followed the above procedure, then you have participated in this research. Soon, this system will launch in Pakistan and no other Pakistani will become the victim of such scammers.